Awesomenauts was released on the consoles in May but I didn’t get around to playing it then. Now, with its release on Steam, I was able to give this 2D, sidecroller/platformer/MOBA mashup a try. As a casual MOBA fan, I was looking forward to this. Most of my MOBA experience comes from League of Legends, with some time spent in DOTA 2 so those stood as my point of reference coming in to Awesomenauts. As a MOBA, it’s pretty bare bones. Two towers to clear, only three players per side, and comparatively cramped maps. Where it stands out is in character design and playability. The side scrolling perspective works well with the platforming elements and makes the game more twitch-reliant then your typical MOBA. All of the typical map elements are present as well, from bushes and the like to hid in for ambushing or escaping to ‘jungle’ areas with monsters for killing. I liked being able to kill low level neutral minions for health which kept me from being required to teleport back to the spawn point as much. The heroes are a little on the goofy side but they’re fun to play. I thought I would prefer a ranged damage dealer – as I do in League of Legends – but I found that the mouse and keyboard controls made it hard for me personally to aim and lead my targets. I couldn’t remember to aim with the mouse while moving and dodging, even though I do the same in LoL and first person shooters all of the time. It feels like a ‘patting your head while rubbing your tummy’ scenario. The graphics aren’t spectacular but are bright and clean. Nothing is ambiguous or hard to see, which is always something to watch out for in 2D, sprite-based games. The voice clips aren’t too annoying, and that’s the best I can say about them. The music however doesn’t do a thing for me. 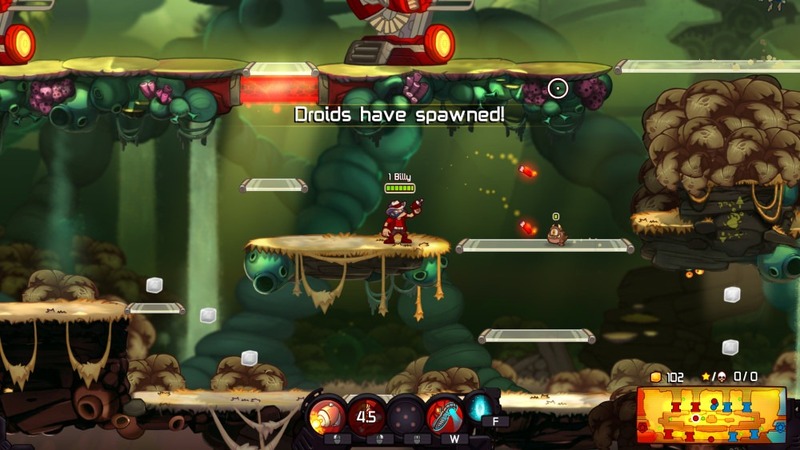 Awesomenauts is a fun game that should get better with time (provided developer Ronimo Games follows through on their word to continually add new stuff to it). As a MOBA it’s ok, and as a platformer it’s below average. Put the two together and you have fun, solid package.